“I want to eat healthy but it costs too much.” I hear this far too often and I think about how you can buy a hamburger and french fries from McDonald’s for 2 dollars and some change. This meal provides a lot of calories but has no nutritional value at all. There comes a point in time where you have to decide whether to spend a few extra dollars to invest in your personal health, or if you want to spend that money on something that is going to detract from having a healthy body. Eating healthy does cost more money than eating the dollar menu every day, but in the long run you will pay for it with bad health and poor self-image. Don’t get me wrong, I love me some fast food, but eat it sparingly. Below you will find a list of ways that will give you the tools to be able to afford eating healthy. Buying whole foods is mandatory to eating healthy and saving money overall. There are many people who don’t understand what exactly a whole food is. Below you will find a small rundown of examples of whole foods. This is not a list of every whole food available, but this will give you an example of what a whole food is. Proteins – The most important and expensive ingredient you will need. Proteins are your beef, chicken, fish, cheese, milk, eggs and should be the main dish in every meal. Ground beef is very reasonably priced. Buy this in bulk and freeze for best savings. The leaner the ground beef, the more expensive. You can always cook and rinse fat from the meat. You can do anything from burgers to meatloaf, brown it and eat it as it is; the possibilities are endless. Frozen Chicken is one of my favorites, I buy Tyson frozen chicken breasts and chicken breast tenders. Making BBQ chicken and grilled chicken salad is quick, easy and very healthy. Canned tuna is cheap. I don’t recommend eating this daily every meal because of the metals found in it, but a few cans a week won’t hurt. Mix a tablespoon of mayo and some relish and you have a quick and easy tuna salad. Buy buckets of cottage cheese; they have plenty of protein, great fats and somewhat low carbohydrates. Eat it out of the tub or mix in some pineapple or peaches to make a tasty treat. Yogurt is a good source of protein and helps with digestion. I like Greek yogurt mixed in with honey, or you can do Greek yogurt, mix in some crunchy granola and fruit and have a great tasting snack. Ground turkey is really lean and light on the pocketbook. Know how to season your food and enjoy some great meals. Eggs go with everything, they are cheap and the more you can buy at once the cheaper it is. Be daring and buy 3 dozen. Milk is good with anything. Drink it for breakfast, mix it with a protein shake, or use whole milk and make some of the best milkshakes you’ve ever had in your life. Buying discounted meats or short sale meats can really save you some cash if you plan on cooking the meat within a couple of days or put in the freezer. Discounted meats aren’t discounted because they are going bad, they are being discounted so someone will buy it before it goes bad and they have to discard it. Fresh fruits and vegetables are a great choice for everyone. The downside to them is that if they are out of season they will not be as tasty and will cost more than when they are in season. Buying frozen fruits and vegetables will save you a lot of money and are usually fresher than the out of season products shipped from overseas and have a much longer shelf life than their fresh counterparts. The reason they are fresher is they flash freeze them and it locks in the flavor and nutrients in the product. If you would prefer purchasing fresh fruits and vegetables, buy in season produce for the best price and quality. Support your local farmers and farmers markets and purchase your foods locally; you will save a lot of money and you will get a product that is superior to anything you have had in a grocery store. Buying generic brands on things like rice, pasta, eggs, milk, cottage cheese, frozen fruits and vegetables will save you some money. Buying generic brands on everything isn’t always a good idea; I don’t like off brand ranch dressing, so I buy what I know. Buying the raw ingredients like this off brand doesn’t affect the flavor or quality. Try it and thank me later. Buying in bulk is a basic principle and it is true the more you buy, the price per unit will drop. This means if you buy 2.5 pounds of chicken at $5 dollars, you are paying $2 a pound. If you were to buy 10 pounds of chicken, you might end up paying $1.25-$1.50 a pound. You end up saving $5 just for purchasing a larger amount. Frozen meats, vegetables and fruits last a while, so buy as much as you can fit in your freezer. Rice, pasta, and oats you can stockpile into your pantry. Buy as much as you can when on sale. So you bought all of this food and you don’t know how to cook. Cooking is an invaluable tool and is almost mandatory unless you have someone who will cook every meal for you. Even if you have someone to cook for you, quit being lazy and learn how to cook. Cooking is an art and mastering it will provide you a way to eat healthy and make the food taste great. There is a misconception that eating healthy and cooking healthy foods involves tofu and bean sprouts. Eating a steak and some brown rice is healthier than any fast food meal and tastes great when cooked properly. Going to the store with no plan in mind is a recipe for disaster if you are trying to stay on budget. Planning your meals a week in advance will let you figure out all of the ingredients you will need. No more running to the store last minute to pick up some onions because you ran out! If you live on a tight budget, eating healthy will have to come with some sacrifices. You must value your health and make it a priority to eat healthy before you can really make progress. If you are looking at your budget and noticing yourself coming $20 short or more, take a look at the activities you are doing that detract you from a healthy lifestyle. Track your spending for a month and see how many frivolous or impulse buys you have. Depending on how much money you need to trim, every candy bar, ring tone, soda, trips to fast food, MP3 from iTunes, cigarettes or anything else that you can go without need to be removed until your budget is satisfied. Eating healthy on a budget will come with some sacrifices, it is up to you to decide how important your health is to you. I am guilty of not looking through ads and seeing what is on sale. Look through ads and see what is on sale and plan meals around these sales. You can save a lot of money using coupons and if you get good enough you can start getting stuff for free, check out extreme couponing. Although this is an extreme measure, if there is a will there is a way. How many times have you been following your shopping list and you walk by some stove top stuffing that you just can’t pass up? Going to the grocery store hungry is like letting a kid go on a free for all in a candy store. You are already in the mood to eat and when you see things that you want, you put them in your cart before you can talk yourself out of it. Don’t go to the store on an empty stomach if you value your budget, I am proof that an $80 planned grocery bill will turn into a $100 grocery bill easily. Impulse buying is closely related to going to the store hungry but has one more obstacle, the wait in line. Standing in line waiting to check out is prime opportunity to get you to buy that piece of gum, buy that crappy Globe magazine or that bottle of 5 Hour Energy. Stores know this and they specifically outfit these areas with budget blowers and stuff that you usually have buyer’s remorse afterwards. When I say avoid eating out, I do not mean never eat out again. I practice what I preach and I only intend to tell you things that have worked for me. I like eating a lot so a trip to a fast food joint can set me back anywhere from $5 – $30 depending where I am and how bad I want to eat. If you are trying to stick to a budget, make sure to plan your meals and have them prepared ahead of time so you don’t get hungry and make a fast break down to Taco Bell and blow your budget. Always plan trips out; it will help you stay on budget and give you something to look forward to. Before you tell yourself “I’m not drinking tap water” hear me out. Of course depending on your area this might not be feasible, but drinking tap water will save you a lot of money. Water is an extremely important part of a healthy lifestyle, you must drink quite a bit of water to stay hydrated. Buying bottles of water gets expensive and can puts a lot of extra plastic into the dumps if you don’t recycle them. 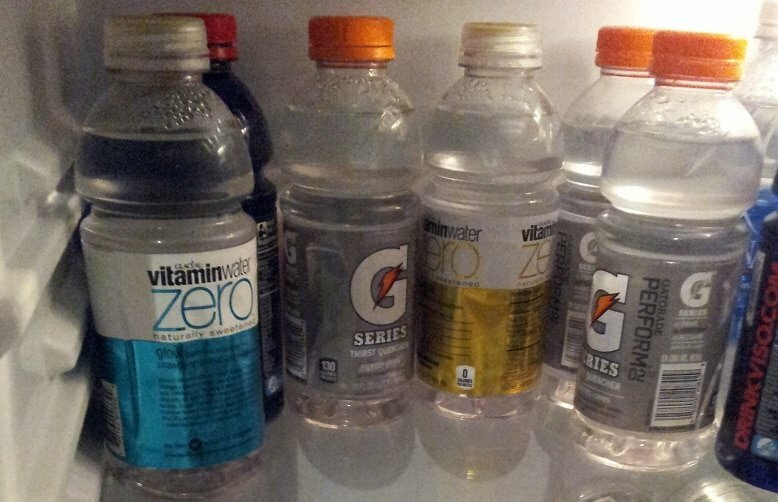 The picture used for this article is of my mini fridge full of some of the bottles I’ve reused. Reuse your bottles that your grape juice, Gatorade and other drinks came in. If you reuse your bottles you can cut down on your trash and you have ready-to-go containers. Believe it or not there are many things that you can grow on the balcony of your apartment, in your windowsill, or even in a garden. Growing herbs in your kitchen gives your food a wonderful splash of flavor and is easy to do. There are many small vegetable plants that you can grow if you have some direct sunlight. Growing your own vegetables can be lucrative or used as trade items with other people or farmers who grow other vegetables. There are many possibilities and it is exciting to think of the possibilities. Below are a few links that I recommend checking out if you think this might be something worthwhile. Supplements are non-essential and I added this section for people who have extra some funds available. Supplements are designed to help with an already existing healthy diet and lifestyle. Whey Protein is somewhat cost-effective and an easy way to get some quality nutrients in liquid form. Protein drinks are usually associated with people who weight train or athletes, but they are a great supplement for anyone. Fish Oil is a great choice because it is heart healthy, helps joints and can improve triglyceride levels. Multi-Vitamins are another great choice because they will help supplement any vitamin you were deficient in. Where do you stand on Jerky? I know the sodium content is high, but is it beneficial to muscle growth? All food is beneficial to muscle growth really. I think jerky is a great snack to have that’s full of protein. I eat it a bit and it’s good and can be filling since you chew so much, so it would help with some weight control. I’m craving some now actually.